It's Emileigh from Flashback Summer, and I'm privileged to be able to do a guest post for Brittany today! When she asked if I would want to, I was super excited. I've been a fan of her blog for a while, and now I get to be a part of it! 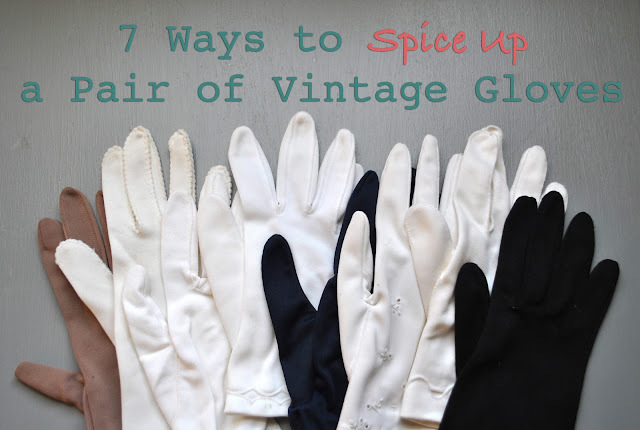 As I'm sure you vintage lovers know, unique and colorful vintage gloves are more scarce, and when you can manage to find them they can be a bit expensive. However, there are plenty of plain gloves around, especially white ones! These plain gloves are a blank canvas for you to dress up according to your personal style and preference, and it's also a budget-friendly way to get the unique glove styles you'd like to have. Today I've got seven ways to spice up a pair of plain vintage gloves that you guys can try! #1: Dye them a different color. I've been looking for a red pair of gloves lately, but I can't find any in my area. So, I decided to dye this plain white pair! It's quick, easy, and doesn't require any complicated skills. This is also a good way to fill in any "color gaps" you have in your wardrobe because you can pick any color you want. This is especially good for gloves that have the stitching on the outside. A while ago, Brittany mentioned that some pale yellow gloves she bought weren't such a good idea, as they looked like dish gloves.... This accent fixes that problem! As I did with this pair of gloves, this technique adds a bit of color that you can match to your outfit without giving a "dish glove" look. It also gives you an opportunity to show off any fancy stitches you've learned. This technique is on the more advanced end of sewing skills, since it involves cutwork. However, if you take it slow (or already know how to do it! ), you can end up with a pretty cool accent. You can outline it in a contrasting color, like I did, or you can keep it subtle with the same color and let your cutwork speak for itself. It makes a fun driving glove or even a steampunk sort of look, I think. #4: Add a cute trim. 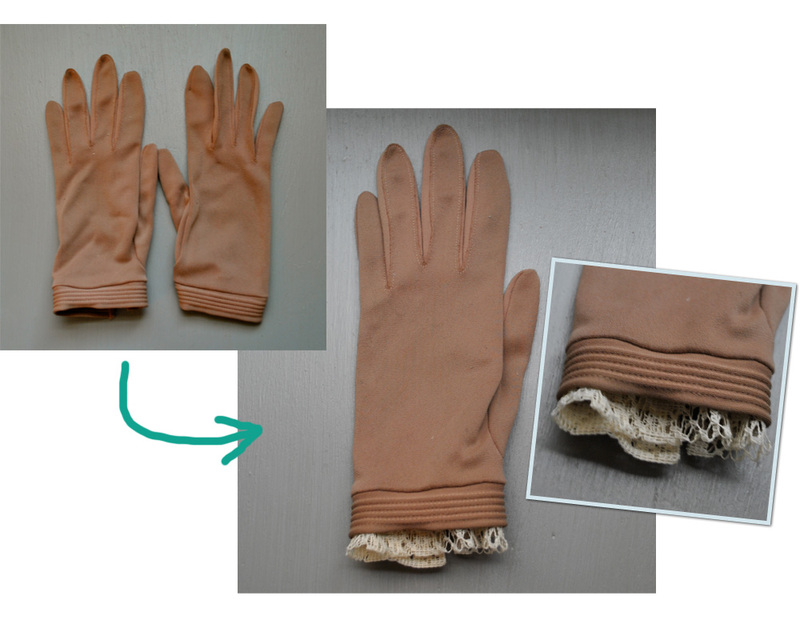 I sewed on just a peek of lace to these beige gloves to add some femininity and detail. However, you could also try a large ribbon, rick rack, or a knitted or crocheted trim. 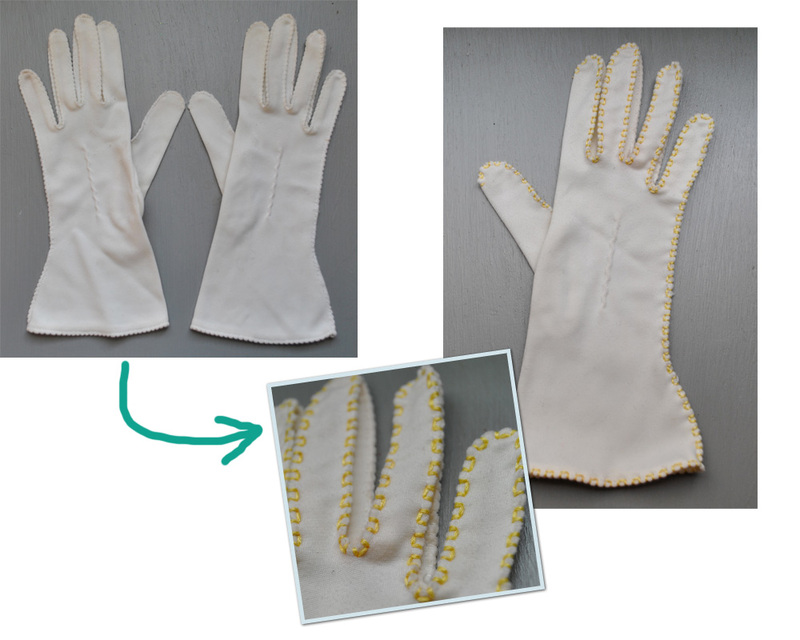 Though it can be a difficult to maneuver inside the glove to embroider it, I think the results speak for themselves! I embroidered the edges of these gloves and added some curliques to accent the little bow that was already there. It added a pop of color and lots of cuteness! This was probably my favorite transformation! There are also lots of possibilities. You can do a fancy stitch on the edge, initials, a small picture, or just a simple design around the wrist. Use your creativity! This is a great opportunity to use any vintage buttons you have in your stash. You can use as many or as few as you want. My pair of gloves already had waves on it, so I accented them with some plain white buttons. However, you could put just a couple buttons at the wrist, line the edges with buttons, or anything you want! It's a good way to showcase your especially beautiful buttons, too. Why be constrained to only one of these techniques? Try a combination, like I did with the gloves above! I dyed them and also added buttons to the wrist. You could add a button and embroider a design around it, dye a pair and edge them with ribbon or contrast stitch them, make a cut out and border it with tiny buttons, the combinations are endless! Get your creative juices going and create something beautiful! Do you think you'd like to try any of these techniques? Which is your favorite? Do you have any other ideas? If you spice up a pair of gloves, I'd love to see them! Great ideas. I'll have to go through my glove stash now. I'd LOVE to see what you try! I always like to see the spin other people put on an idea! REALLY great ideas! Super helpful, definitely pinning this post! Thanks, Stephanie! I really appreciate that! Aw, thank you! I try, I try. Thanks for the opportunity! 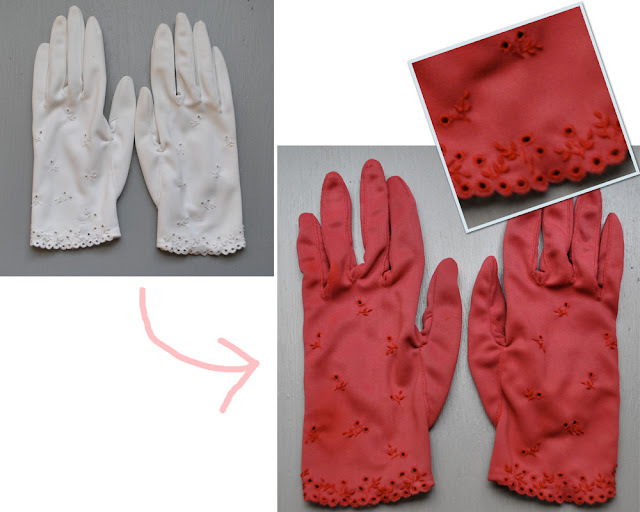 Cute ideas!I'm usually not big on altering vintage but the dye idea is perfect for some stained gloves I have. That's what I thought, too! 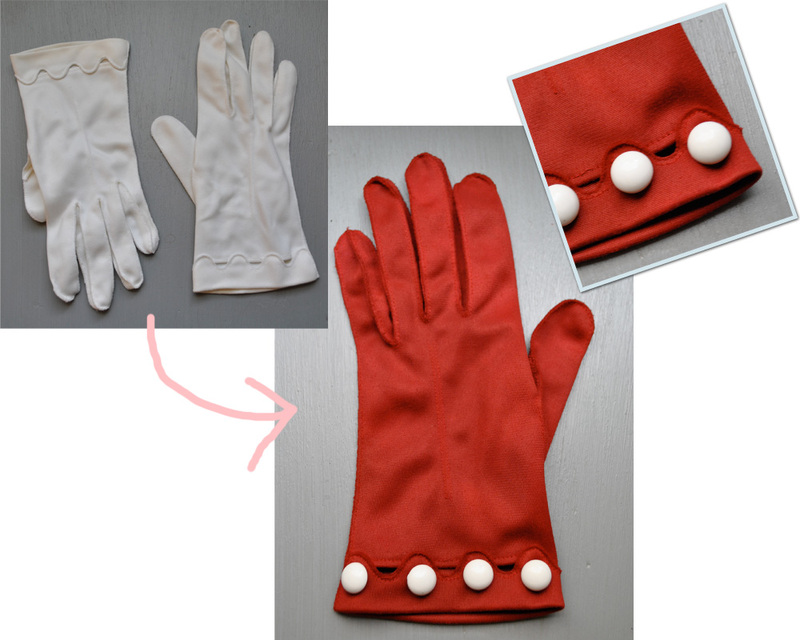 Some of my white ones have lipstick stains on them (it took me a while to get used to the lipstick-glove combo.....), so I either bleached the spots or dyed the gloves red for this post. 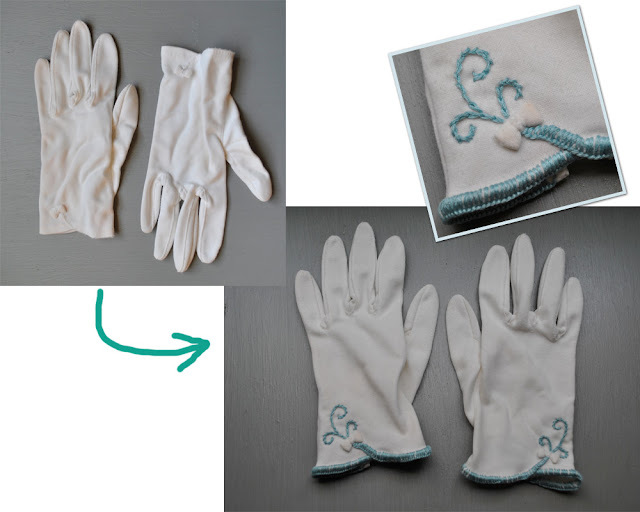 Of course, you can't bleach non-white gloves, so dyeing is a great option! I'd love to see your glove transformations! Lovely ideas! I'm sharing with folks on my FB page!! Thank you very much, Mandy! What a post full of good ideas!!! I had already added buttons but never thought to dye some plain gloves! I will try for sure! But I'm not a gloves girl, most of the time I don't know what to do with them fearing to stain them... they always end in my purse! Hey, I totally feel the same way. I'm trying to get myself to wear them more, because mine usually end up in my purse too, but I love how they look! The idea of being able to dye them in case I mess them up has helped ease the stain fear. THese gloves are adorable.. I love the dyed ones, and the dyed ones with the buttons are gorgeous.And the embroidered ones...so cute.. Great job.. Enjoyed them. Thank you for sharing. Thanks so much, Bunny! I love your blog, by the way. I read it regularly! That.... is a GREAT idea! I am a bling fan as well. Thanks so much for reading and commenting! It would be super great to see what you do if you try any of the ideas, too! Super ideas! I've been meaning to try one or two - especially dyeing, but it's worth mentioning that dyeing only works with cotton gloves. I love the button-embellished pair - how have I not thought of that before?! You can actually get dye that works for other types of material as well, I found out! The dye I used worked for several types of cloth; I just had to add another ingredient like salt or vinegar to it, depending on the fabric. I used "Rit" scarlet dye in this post, and it said it would work for cotton, rayon, ramie, linen, blends, nylon, silk, or wool. I'm not sure if you can get that, but it would be worth a try to give yourself more dyeing options! Terrific guest post and ideas! Sometimes one encounters pairs of vintage gloves that have seen better days, but could easily be brought back to life with any number of these terrific ideas (for example, contrast stitching could salvage a pair with split seams). 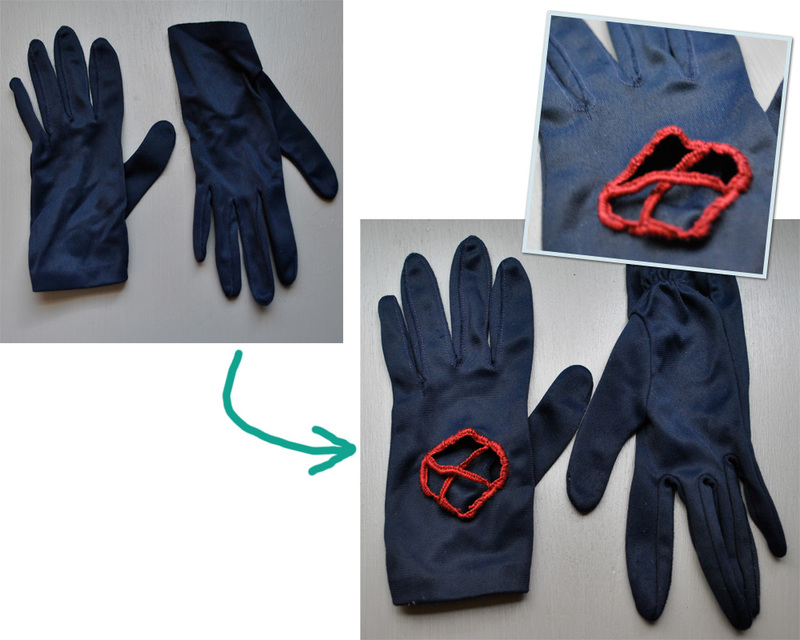 That's actually exactly what I did with the contrast stitching gloves! The side of one was completely split, and I did indeed put it all back together with a more decorative stitch! It worked well! Good thought. Thank you very much, Brittany! That is what I love the most: converting nice clothes into vintage look clothes. I love all these ideas very much and time to time experimenting with them. Thank you again! Thank you very much, Nika! If you try any of the ideas, I would love to see them! What great ideas! I loved them all. Thanks for sharing. Aw, thank you! I appreciate your comment! Any time! Thank you very much! They are all lovely ideas, i Will definately try Them. I especially love the button detail, don't we all have pretty vintage buttons in Stock? I know right?! I have so many pretty buttons, but sometimes I only have a few of them, not enough to use in clothing. On a pair of gloves would be a great place to showcase them! I would LOVE to see what you try, too! Snap some pictures and show me your creations, if you have the time!